Q.21 What is the alternative of CVC4 diffusion pump oil. Ans. 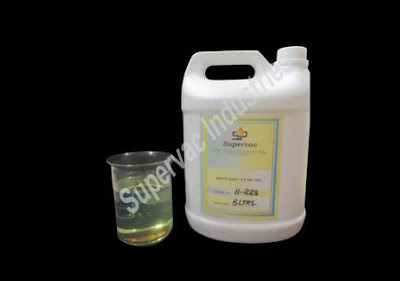 Supervac Industries, New Delhi manufactures silicone diffusion pump oil SV-SIGMA. This oil is a perfect alternative of CVC4. Infact, SV-SIGMA has a much larger satisfied customer base and has been in use much before CVC4 started getting promoted. Q.22 Can somebody supply me DC-702/DC-704/DC-705 diffusion pump oil? 1) SV-SIGMA FAST which is an alternative of DC-702. 2) SV-SIGMA which is an alternative of DC-704. 3) SV-SIGMA PLUS which is an alternative of DC-705. Even when DC-702/DC-704/DC-705 was available a large number of customers were using SV-SIGMA, SV-SIGMA+ and SV-SIGMA FAST because of considerable technological and cost advantage. Q.23 Do I need to clean jets of my diffusion pump, every time I change diffusion pump oil in it? Ans. If you are using good quality silicone diffusion pump oil then you need not waste precious machine time in cleaning of jets every time you change diffusion pump oil. Cleaning them once in about 5 to 7 years is enough. Q.24 I am using silicone diffusion pump oil. Can I top up with hydrocarbon diffusion pump oil? Ans. No, Silicone diffusion pump oil should never be mixed with hydrocarbon diffusion pump oil. So if you are using silicone diffusion pump oil then top up with silicone diffusion pump oil and if you are using hydrocarbon diffusion pump oil then top up with hydrocarbon diffusion pump oil. Q.25 What should be the basic properties of silicone diffusion pump oil? Ans. Silicone diffusion pump oil should have very low vapor pressure, should have high thermal stability and should be resistant to oxidation. These are very basic properties of silicone diffusion pump oil. Q.26 What should the be basic properties of Hydrocarbon diffusion pump oil? Ans. Hydrocarbon D.P. Oil should have very low vapor pressure, should have high thermal stability and should be resistant to oxidation. These are very basic properties of hydrocarbon D.P. oil. Apart from these qualities, hydrocarbon diffusion pump oil should not have aromatic compounds and artificial additives as these may turn to gel form or black tar like substance and harm the pump interiors. Q.27 What is Holding Pump? Ans. Holding pump is a simple rotary vacuum pump of small capacity. Its function is to create holding vacuum for diffusion pump, hence the name Holding Pump. It is invariably connected to diffusion pump and not to the vacuum chamber. Q.28 Can I use diffusion pump without using a rotary pump in my vacuum system? Ans. No, Diffusion pump cannot be used alone. Reasons are explained below. A diffusion pump merely creates a vacuum gradient along its length where vacuum in top portion connected to vacuum chamber is very high and vacuum at the bottom of diffusion pump is low. Since even this low vacuum is better than atmospheric pressure so diffusion pump cannot discharge in atmosphere. Rotary pump therefore is added to evacuate the air from bottom portion of diffusion pump. Q.29 What is stalling of Diffusion Pump? Ans. A Diffusion pump works on the principle of gas diffusion. This pump requires Diffusion Pump Oil, which evaporates, gets compressed and then escapes through jets, trapping air on its path down to the bottom of Diffusion Pump and from there the air is evacuated by a Rotary Pump or a Booster Pump-Rotary Pump combination. For this arrangement to work, vacuum of minimum 10-1Torr in required to be maintained in the main body of Diffusion Pump. Otherwise the Diffusion Pump Oil escaping from jets in gaseous form collides with too much air available and further raises pressure in Diffusion Pump body. This stops creation of vacuum and is called Stalling of Diffusion Pump. Q.30 What is the work of baffles in a diffusion pump? Ans. Baffles are provided at the top of diffusion pump. They stop diffusion pump oil from escaping into vacuum chamber. 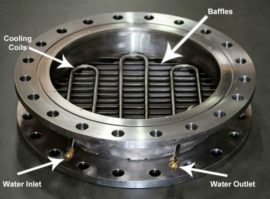 Baffles should be properly water cooled to perform their function effectively.